"Where are the notes I took online while at the library Tuesday night?" A question such as this might be best answered by the likes of GNOME Zeitgeist. At the GNOME Users' And Developers' European Conference (GUADEC) track at the Gran Canaria Desktop Summit on July 5, Federico Mena-Quintero, Seif Lotfy and Thorsten Prante presented their Zeitgeist project. The team was working on a new way to make users' files searchable based on their daily usage events and patterns. Zeitgeist consists of an engine that logs events and an activity journal that presents the logged events as a GUI. While the Zeitgeist engine is logging (per systrace) which applications are running and which files or URLs they're opening, the journal viewer can show a user which document he was viewing while email from his mother came in Monday of last week. 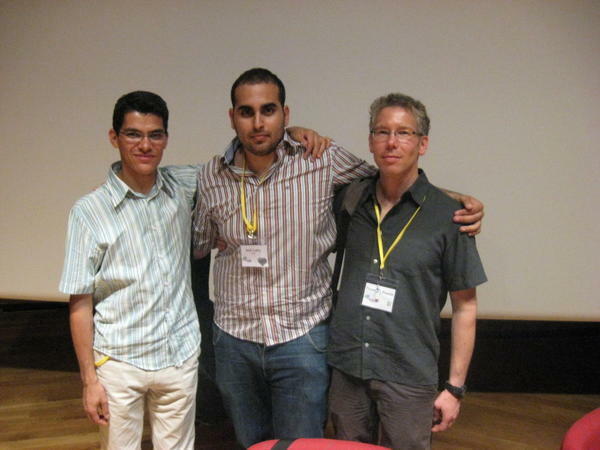 The Zeitgeist team l-t-r: Federico Mena-Quintero, Seif Lotfy and Thorsten Prante. In this way the application can nudge your episodic memory to make event connections and organize your life. Zeitgeist's activity journal is the work of Seif Lotfy, currently a student at Darmstadt University. It shows user events based on date and time, and keeps track of the most commonly opened and collaborated upon files -- resulting in a semantic connection between the two. Commonly occurring patterns can point to particular work activities. For example, opened source code together with an opened PDF and a bugtracker URL running in the browser can mean software development activity was going on. Thorsten Prante also indicated that Zeitgeist can pull external conditions into the equation. Next to time, GPS location can also be a consideration, so that a question such as "What file was I working on during the train ride from..." can be answered. The Zeitgeist team clarified that their work isn't an index or desktop search such as Tracker or Beagle. Instead it simply tracks events and evaluates them. However, this doesn't mean that Zeitgeist events can't be combined with Tracker tags. At the end of their presentation, the Zeitgeist team showed a particular application for their software: parental tracking. The software can close a child's browser or send a warning email to its parents based on detected usage events. While the use case provoked a mixed and even negative response from some, Seif Lotfy emphasized that it was only one of many possible Zeitgeist applications. Zeitgeist at the conference: it tracks events such as programs started, files read and websites visited. The tracker daemon Gnome Activity Journal called Zeitgeist has a new user interface. Following over a year's worth of work the GNOME Activity Journal now appears in its first developer version, 0.3.2. The Zeitgeist framework it uses assumes the same version number. 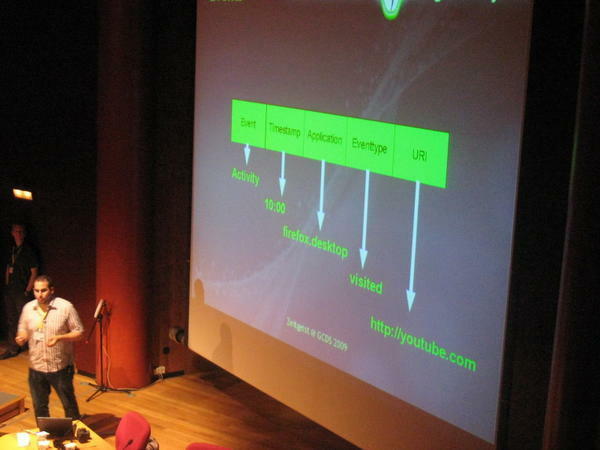 The Cross-Desktop Metadata track at this year's Gran Canaria Summit highlighted developer activity targeting central storage of contact data, email and other personal information.